When did you last measure the business impact of your technology investments? Managing costs effectively can only take your business so far. However, what your enterprise really needs is accelerated growth. Whether it is entering new markets, introducing innovative new products, or initiating transformational process changes, you need to unlock the key value levers of your business aggressively. Very powerful waves of change are creating new opportunities. The advent of the digital consumer, smarter organizations with simplified operations, and emergence of the cloud, are some significant examples. Interestingly, IT is inextricably linked to these emerging trends driving business growth. However, there is merit in exercising caution here. 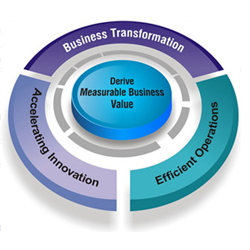 Often technology investments do not deliver the business returns that enterprises expect. For too long, enterprises like yours have not been able to understand the true business impact of software implementations, technology purchases, and consulting. Business value is rarely ever defined, and even when it is, it overlaps across programs, which is then viewed differently by the critical stakeholders. Advanced Technology Group, a global consulting and IT services leader, is laser-focused on delivering actual business value. If you have ever struggled to justify ROI or to define and track real business outcomes, rest assured that we are built from the ground up to solve that for you. Whether it’s a typical ‘business-as-usual’ engagement or handling your largest, most complex projects, Infosys helps you derive the measurable business value that you have always been looking for from business and IT investments.